Potato chips based on pellet were born in the beginning of the 80’s in Europe. 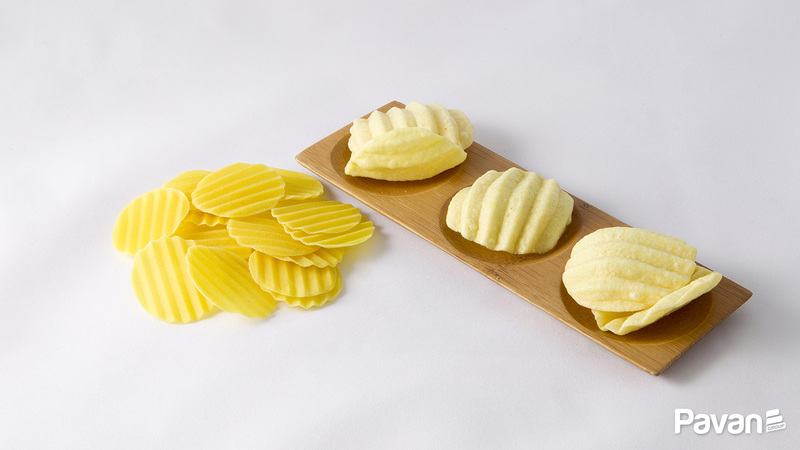 The product was presented as an healtier alternative to the traditional potato chips with a lower oil absorption. 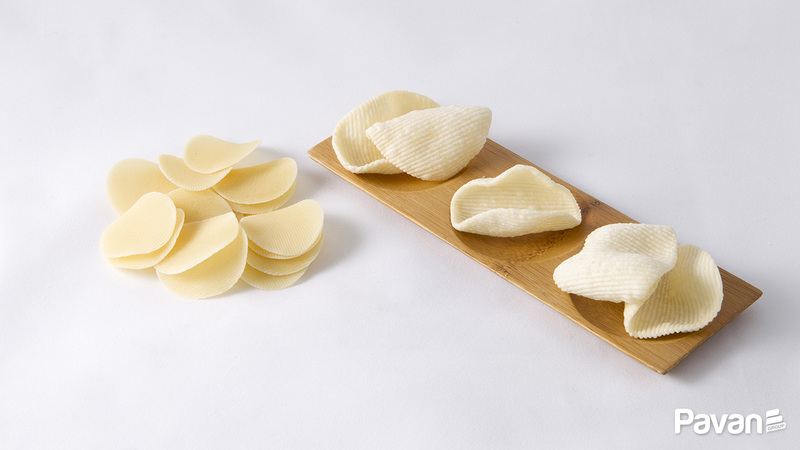 From the first time they obtained an incredible success thanks to their shape and crunchiness that remain the same all over the years and also thanks to the easiness of producing a chip with costant quality and attributes. The simple principle of expansion of the pellet snacks allows the utilization of a wide choice of starch based raw materials. Cereal ﬂours are the most common ones, followed by root starches like potato and tapioca and cereal starches. A great advantage of the pellet snacks technology is the possibility of making formulas with peculiar characteristics like high fibre content, multi grain or multi coloured. Although the pellet production process generally includes a step to cook the starch matrix, allowing the use of raw ﬂours and native (uncooked) starches which are cheap and widespread, some common raw materials are already cooked, such as the potato based raw materials like potato ﬂakes and granules. Sometimes precooked or par-cooked cereal’ raw materials are also used. 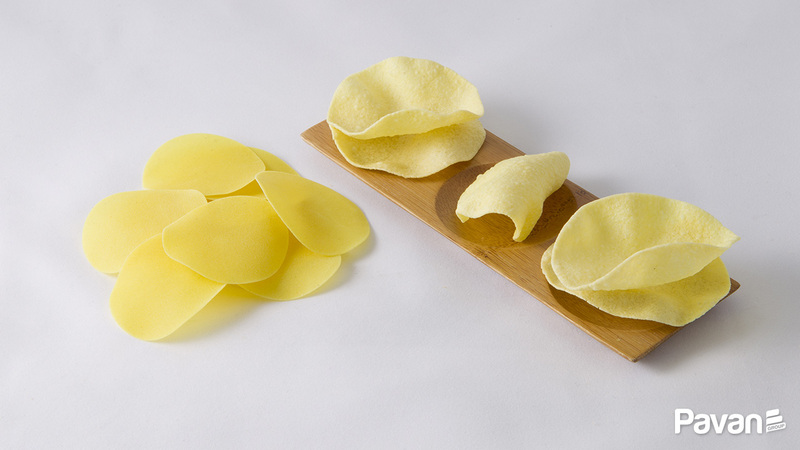 Pre-cooked materials generally do not require going through the cooking step but only the phases related to shaping and drying. Pellet snacks are produced dried and semi-processed for easy storage and shipment and in a second phase are expanded, seasoned and packed. 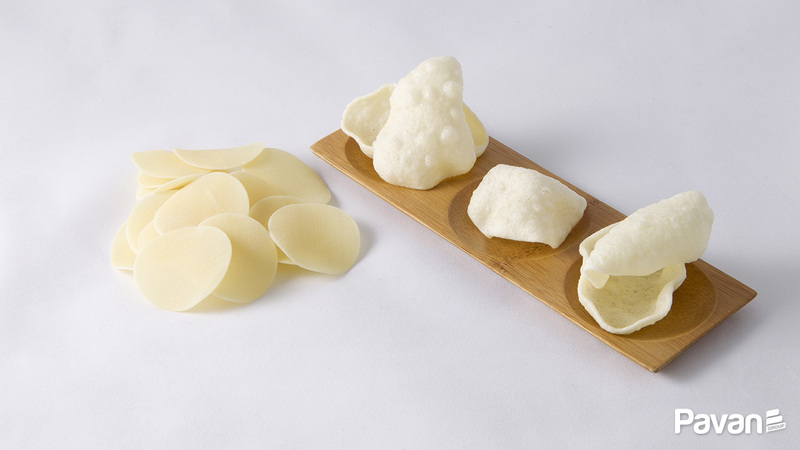 The pellet snacks’ peculiar capability of expanding is due to the presence of gelatinized or partially gelatinized starch in their matrix. The water entrapped into the matrix, if heated rapidly above boiling point, evaporates thus creating an internal pressure; the gelatinized matrix itself becomes less viscous and keeps the water steam inside for a certain time increasing its volume. 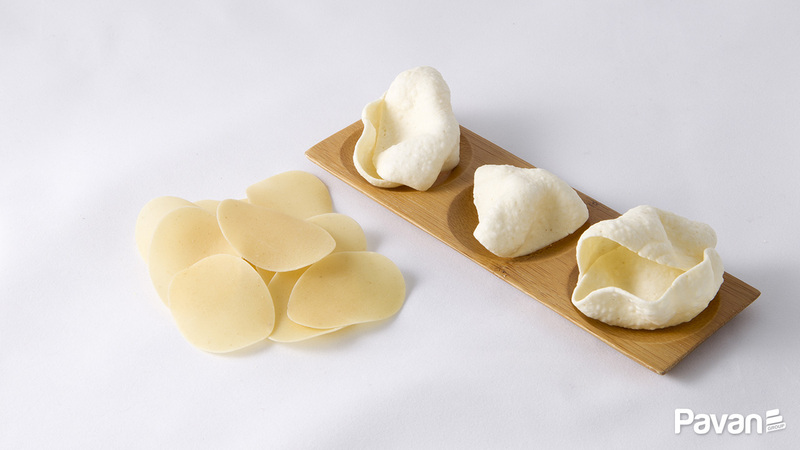 The volume of the product increases and reaches again rigidity due to lack of water: the result is a light, crunchy and pleasant snack. 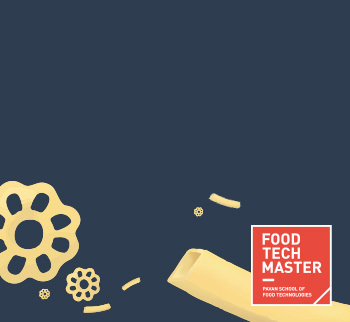 Many cooking systems have been and are in use to produce pellet snacks from unprocessed ﬂ ours and starches but the most internationally known and used is the cooking extrusion system. Forming extruders are used to shape the pellets after cooking, to make die cut products or to extrude sheets or ribbons to be shaped and cut at distance from the die. 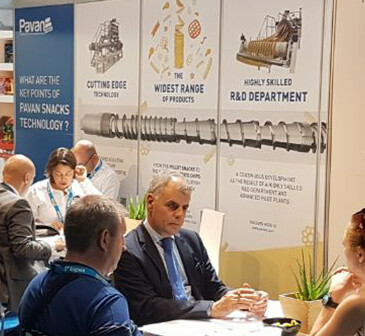 When the raw materials are already pre-cooked, like for instance with potato based products, there is no need for the cooking step: this pellet production process is referred to as cold extrusion. 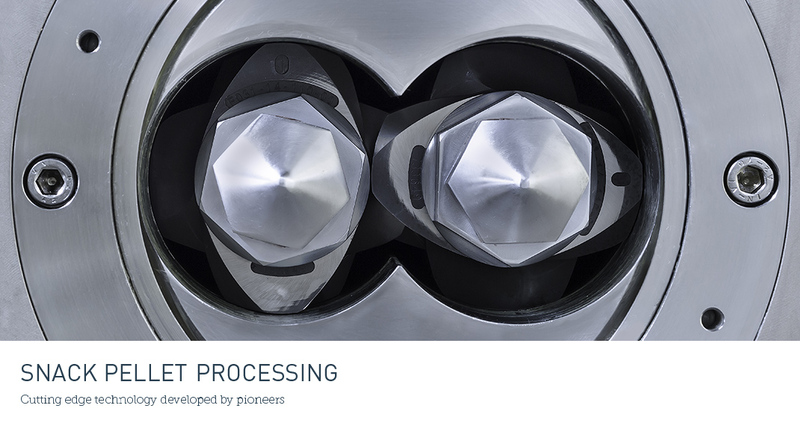 All raw materials requiring cooking are processed in the fi rst extrusion-cooking step, followed by the shaping step of the cooked mass, which can be either the above-mentioned cold extrusion or any other system capable of giving a correct shape to the hot dough before the drying. 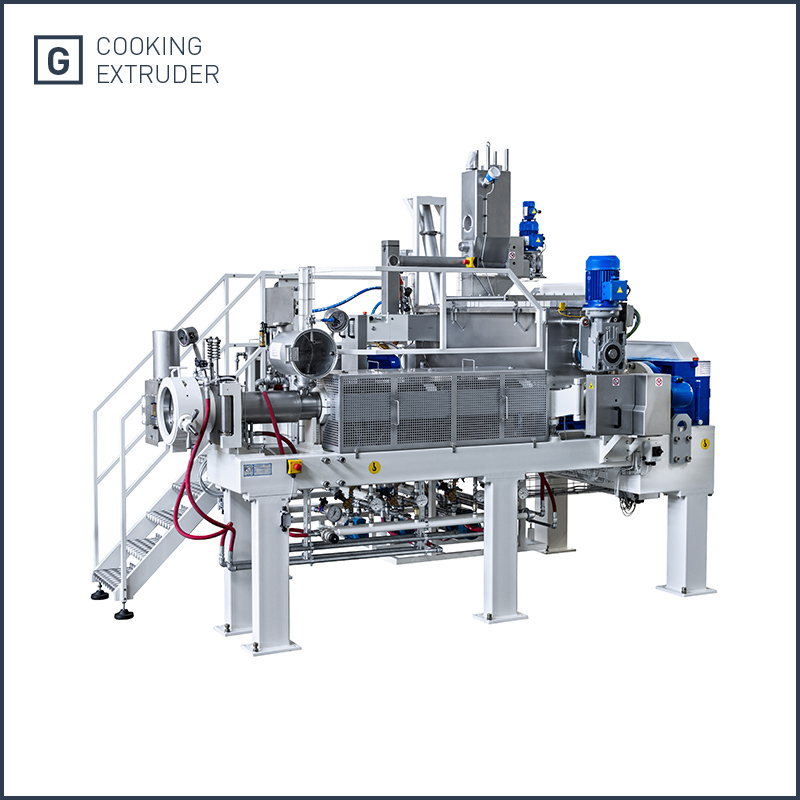 The model F was designed for the extrusion, forming, at controlled temperatures of pre-gelatinized raw material and/or cooked doughs coming from a cooking extruder, using interchangeable dies and a suitable cutting system. 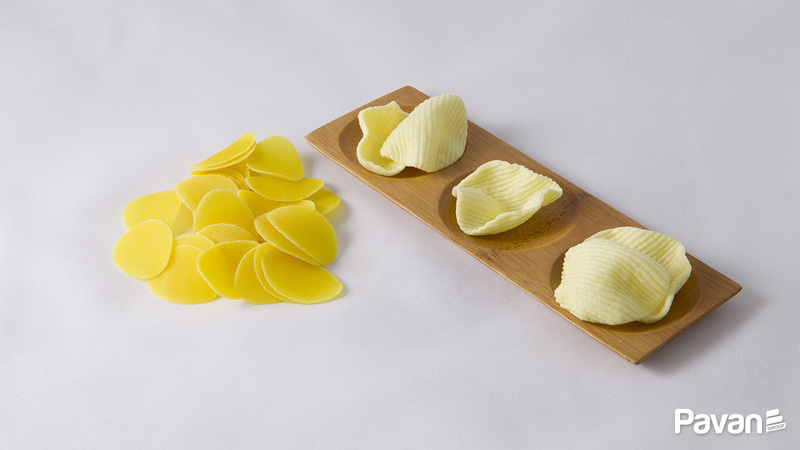 A wide range of products, such as snacks, breakfast cereals, traditional pasta and special dietary pasta, is obtained by varying process conditions, raw materials and replacing dies. Six stages single screw low shear cooking-extruder G200 model. The unit can process automatically and continuously a great variety of ﬂ ours and cereal/potato starches, both mixed and in pure state. Equipped with dosers for solid and liquid ingredients, high speed pre-mixer, mixing tank, extrusion group composed of motor with variable speed, gear box and thrust bearing group. Forced feeding screw, modular type cooking screw with interchangeable shear locks, segmented barrel with independent thermo regulation, peripheral extrusion system complete with cutting group. 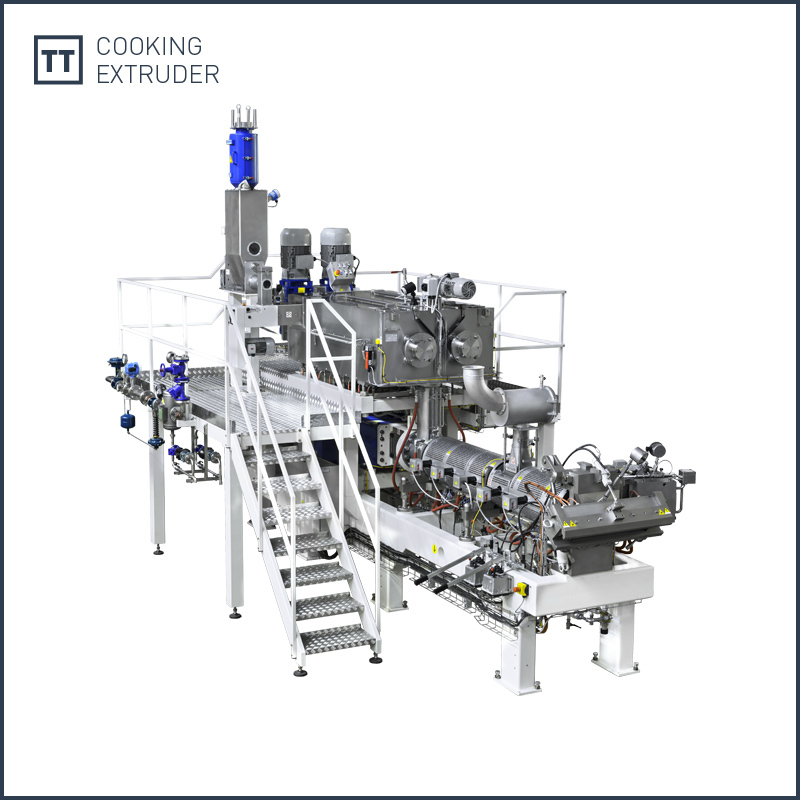 The TT cooking-extruder continuously and automatically gelatinizes ﬂ ours and starches. After dosing the raw materials it starts the mixing phase, adjustable in accordance to the product needs. Thereafter comes the extrusion section. 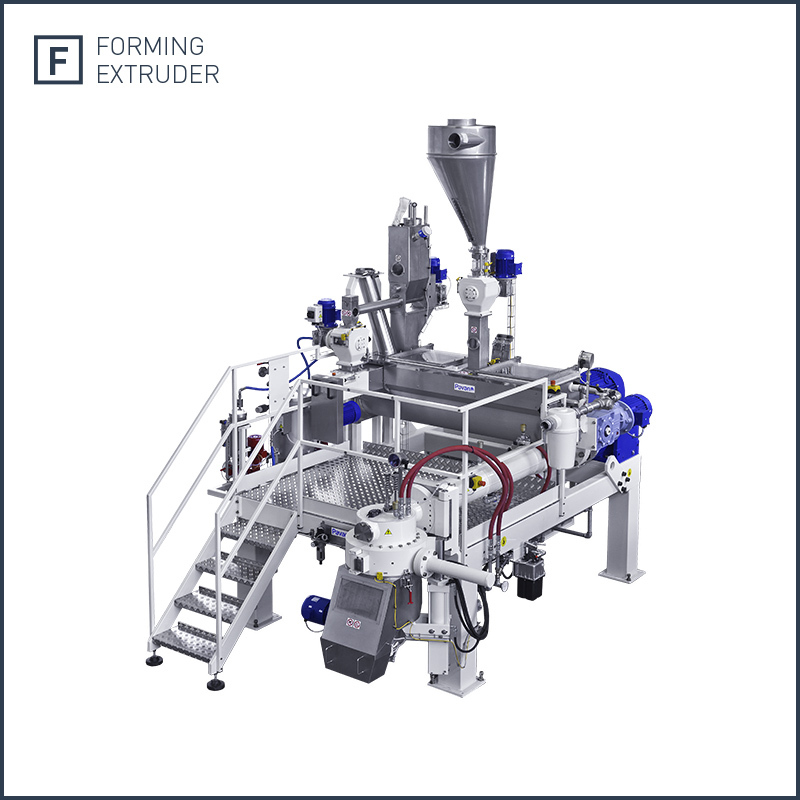 The TT extruder is a modular machine featuring segmented barrel, available in both closed or clam shell type (up to the TT 70 model). Different heating and cooling systems are available for the barrels. They can be equipped with feeding port, steam/liquid injection port or venting port (atmospheric and under vacuum according to speciﬁ c needs). 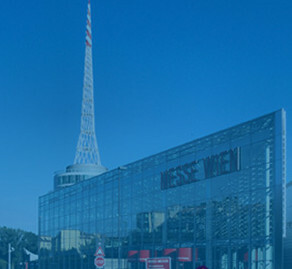 Snackex Exhibition 2017: the snack market meets at Vienna!